Previously you’d have been excused for thinking that a Video Game Group offered rehabilitation for people who couldn’t be separated from their Xbox for longer than it takes to make a peanut butter sandwich and those who prefer World of Warcraft to sleeping. But no. Where old-school geeks have book group, new-school geeks have video game group – where they meet up and chat about the themes, plot twists and easter eggs in their favourite games. That’s the idea anyway. EA Games hope that these “console clubs” will take off. They started the ball rolling by getting a group of gamers together in a London pub to talk about new game Mass Effect 2 out on Friday. Tom from EA told us that it was a mixture of hands-on play, red wine and debates over character motives, themes and plot points. Since Mass Effect is a sci-fi narrative game with lots of characters it does lend itself to the book group treatment in a way that other don’t. 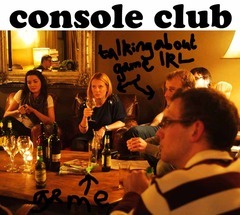 The notion of console clubs definitely reflects changing attitudes to video games. And proves once and for all that yes, gamers can talk IRL in “social” situations.